Arkham Asylum opens with Batman capturing Joker. He's been causing mayhem in Gotham City having broken out of Arkham Asylum, which is currently also housing many sane but violent inmates from Blackgate Prison. Upon his return, Joker escapes again, this time into the asylum, where he reveals his plan was to trap Batman inside Arkham all along. This is where we step into the shoes of Bruce Wayne's alter ego, to put a stop to Joker's maniacal plans - and all in the space of just one night. 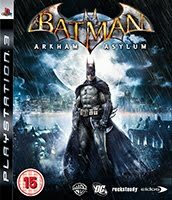 Batman: Arkham Asylum follows the darker feel of the Batman Begins and The Dark Knight films, and manages to sustain a suspenseful atmosphere throughout. The story itself pulls you in, and manages to keep unexpected by utilising lots of plot twists. Several villains pop up during the game (including Poison Ivy, Killer Croc, and, of course Joker, just to name a few), but, despite this, it never felt as if villains were there just because the developers could add them in - they all had an integral part to play in the plot. The length of the game was just right for me, although some may find it a bit on the short side - it took about 10 hours to finish one playthrough. Only one small plot hole was noticeable to me, where Commissioner Gordan is seen leaving Arkham Island by boat, before re-appearing at the end with no explanation. While this problem is insignificant, with an otherwise rock-solid story, it shouldn't have been overlooked. Silky smooth gameplay, combining stealth and action, surpasses nearly all other third person adventure games I have played. Grappling around was great fun, and the stealth sections were both enjoyable and tense. Unfortunately, the section in the Titan Drainage room, where you couldn't grapple, showed that the manual climbing wasn't as smooth as in some games (Uncharted, for example). Otherwise, excellent, with well-thought out controls complimenting the gameplay mechanics. The Freeflow combat system is simply brilliant - performing a powerful jumping reverse kick - in slow motion - into the face of an enemy thug is very satisfying. 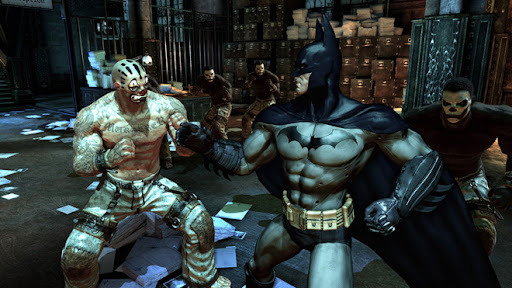 Mastery of the Freeflow Combos, especially timing and judging the distance on Counters, can be a bit tricky, and the system does have a few hiccups when Batman ends up doing things you don't want, like attacking the wrong henchman. Also, I did feel that the use of the game's Detective Vision was a little too tempting, and, unfortunately, detracts from the game's visuals when on. I encountered very few, if no, glitches during my playthroughs, and definitely nothing game-breaking. Leading on to the graphics, this is easily one of the best looking games on consoles. Despite being released over 18 months ago, few games have managed to surpass it - a feat made even more impressive considering this game is multi-platform. The sheer amount of detail put in to the textures and modelling was amazing, with the developers doing an amazing job to make a very large area look 'lived-in' and most importantly, unique in different areas. Some of the henchmen were obviously re-used models, but with the amount of detail put in to everything else, and the fact that nearly every other game ever made re-uses character models, this can't detract from the beauty of it. On top of Arkham Asylum's graphics, the sound is superb too. While there weren't epic soundtracks, the voice acting (all the main voice actors also voiced their respective characters in the animated Batman series, which will keep the older fans happy) and the ambiance meant that the characters were believable and the atmosphere was successfully maintained. The amount of little details, from the drips in Croc's lair, to the comments made by the henchmen, to the radio/TV broadcasts inside the Asylum, all built up to make the Asylum feel alive and real. As with the graphics, there is just so much detail. I played the game's story twice (once on Medium and once on Hard), as well as going back to find all the collectibles, to snag those pesky trophies. Those not interested in trophies may not want to replay the game, but a good selection of trophies meant that I did, and I explored every corner of the game because of it. The Challenge Rooms were definitely the most difficult part, and many may give up on these, but those that do soldier on - like myself - will be rewarded with that shiny platinum. The trophies themselves were pretty balanced. Some basic ones included completing the story on varying difficulties, collecting collectibles and completing the Combat Challenges, which certainly made me explore everything. A few welcome ones were the more jokey ones - hanging an enemy from a gargoyle and then cutting him loose with a batarang to scare the other thugs was particularly amusing, and I continued to perform this move simply because it is just plain funny to see the enemies' terrified reactions. The trophy icons themselves are reasonably well designed too, and are at least unique. 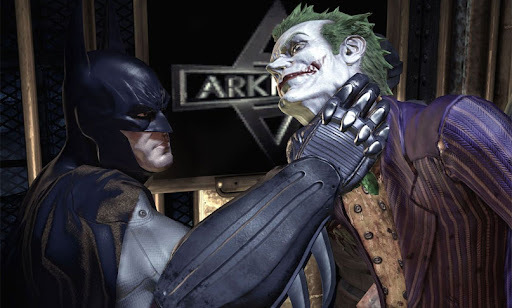 There's no multiplayer mode for Arkham Asylum, and I'm glad to be honest - the game stood up on it's single player alone, with no need for multiplayer. This is definitely a game designed for single player, and single player alone. Overall, I was completely amazed by this game. It's been added to my list of all-time favourite games and is a must-buy - you won't regret it. And this far after the original release, it should be cheap too.